A blind with a sunscreen mesh fabric gives you a filtered view as well as cutting out most of the harmfully UV. A blind with a translucent fabric allows light into the room and also gives you privacy. A blind with a block out fabric blocks out both the light as well as the view and is most commonly used for bedrooms. 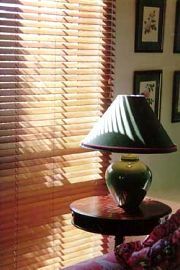 With a Venetian blind you can adjust the angle of the blades to obtain the desired effect. Internal blinds are generally more economical as they do not need to be made of the same heavy duty components to cope with the extremes of climate that external blinds require. Ozsun Roller Blinds have a smooth contemporary appearance because of their inconspicuous hardware and lack of side hems. Ozsun Roller Blinds may be finished with a neat aluminium bottom rail or any of the traditional trims. When closed Ozsun Roller Blinds give excellent privacy and may be positioned at any point in their drop to allow light control. 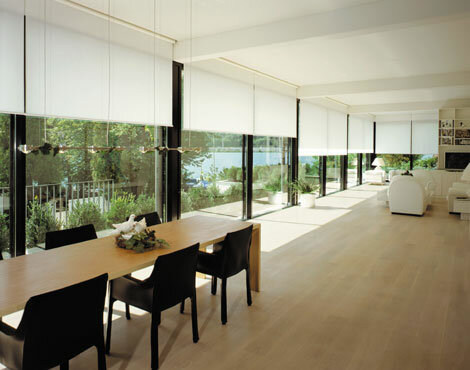 Simple to use, roller blinds come in an range of sunscreen control fabrics, all designed to reduce glare and protect your furnishings from harmful UV radiation. Also available is a full range of decorative sheers, translucents, and textured blockout fabrics that meet the highest demands of the contemporary designer. 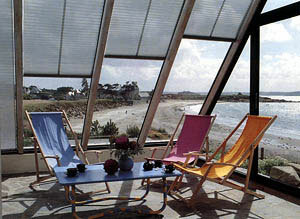 A double blind gives the flexibility of having a sunscreen fabric during the day to maintain a view while being able to drop a full blockout fabric for privacy at night. Ozsun roller blinds can be either chain control or motorised. They can be installed on brackets or within a cassette pelmet. Ozsun roller blinds are normally under-rolled. This reduces the gap between the glass and the fabric and helps to reduce heat gain in the room. They can also be over-rolled with the roller concealed behind the fabric, this gives clearance, for example where the blind needs to clear a door handle. Our premium Helioscreen roller blinds are manufactured in Sydney. With over 25 years experience in manufacturing bespoke internal and external blinds, Helioscreen is Australia’s leading distributor of adjustable sun control solutions. Helioscreen’s manufacturing techniques are industry leading, using premium components sourced from the worlds best suppliers, and cutting edge machinery for producing custom made products. Helioscreen is proudly independently Australian owned, and all systems are manufactured on site in Sydney. Offering a full range of industry leading roller blinds, it’s no wonder that Helioscreen is the No.1 choice for architects and interior designers. As with many of our products we have a range of systems to suit various needs. Below is a guide to the various Helioscreen roller blind systems. One of our consultants will be able to determine which of these systems is best suited to you’re needs. Ozsun Venetian Blinds are colour coordinated, that is the tapes, cords etc are all supplied in toning colours. Venetians are available in 25mm (Slimline), 16mm (Micro) and 50mm (Traditional). The colour range is extensive. Slimline 25mm also have a range of perforated slats. Hold down pins are an option on Ozsun Venetians and are beneficial for areas where windows and doors may be opened. They steady the blind and stop it blowing in the breeze or banging when the door is opened. Ozsun Pleated Blinds offer a range of effects depending on the fabric chosen. They vary from translucent fabrics which keep your view to blackout fabrics which give you privacy at night. all fabrics come in a large range of colours. 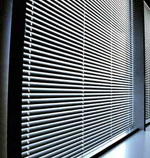 Ozsun Pleated Blinds can be adapted to most window types. 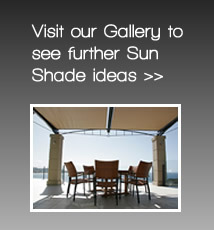 The Ozsun Pleated Blind is also ideal for skylights. All hardware and cords are colour coordinated to the fabric. Ozsun Cedar Venetians are made from “Red Cedar”. This is a plantation grown tree that is grown specifically for timber blinds in North America. It is not a rainforest tree. The slats, fascia and bottom rail are all red cedar and are finished in a clear lacquer. The slats are graded as much as possible so that you can choose between light-medium or medium-dark. 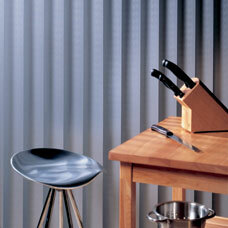 The headbox is steel, coloured to tone with the slat colour and is covered with a red cedar fascia. The fascia is fitted on site with clips to facilitate removal should the blinds need to be removed for window cleaning or painting. The pull cords and tilt cords are colour coordinated. The maximum size for which operation is guaranteed is four square metres due to the weight of the blind. Cedar Venetian Blinds will be more functional if they are split to coincide with window mullions. Blinds can be made with a common headbox but if the total width is greater than 3600mm there will be a join in the timber facia. Ozsun Verticals are a very practical and decorative window furnishing. Ozsun Verticals offer a great deal of flexibility in light control. They may be tilted to any angle to regulate the amount of light entering the room while still retaining a degree of privacy. Many of different types of fabric are available that offer a range of light and heat control characteristics. Top fix to a horizontal surface, such as a ceiling or window frame.